A simple to use, colour-matching tool is now available for free. 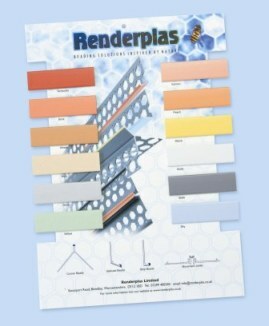 To help perfectly match colour beads to coloured renders, the Renderplas Colour Card is made with strips of the actual PVCu used in the beads. Because the Colour Card uses real material rather than a colour printed representation, the match is completely authentic. The 12 coloured strips are mounted on an A4 polypropylene backed card in such a way that the large cut-outs around them make comparisons simple and reliable. This is a great tool for architects, specifiers and reps not just because it is accurate, but because it is slim, convenient and easy to keep to hand whether hung on the wall or stood on a shelf. Contractors and merchants should find it handy too. 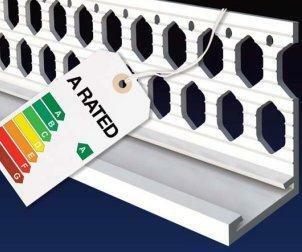 It is robust enough to survive in a site office environment, a van or on a busy merchants counter. If you do ever need another one though, they are free and Renderplas are always happy to supply a replacement. Renderplas hope that this simple device will take the guesswork out of selecting the right colour bead to go with render that is specified and ultimately, that its use will lead to cleaner, crisper and more pleasing finishes to rendered buildings. For renders of 6mm to 15mm depth, Renderplas are able to supply a wide range of Colour Beads from stock and have a long and successful history of innovating in beading technology. Click Here to request your Colour Card.